Writemonkey 3.0.9 Beta is available for download. Donate via link above if you are donating for version 3. For version 2 donate from the main page! Writemonkey 3 is a new incarnation of the original Windows only application that has been around since 2006. 10 years old and still kicking. 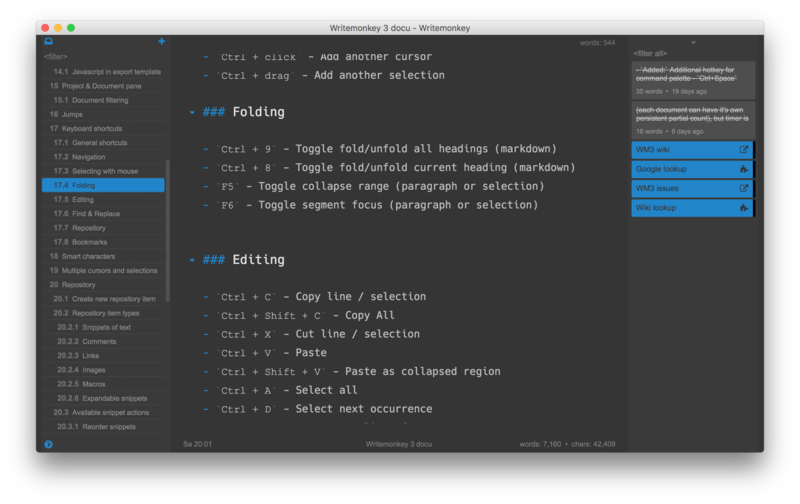 It is quite possible that WM was the first text editor for writers with full markdown support. It was also among first distraction free editors out there. Writemonkey 2 will still be available for download, but won't be developed any further. WM3 is available for all three major OS platforms - Windows, OSX and Linux and this is something that couldn't be done with the old code base. Also, hi-res displays are becoming popular and WM2, without unreasonable makeover, just isn't ready for that. 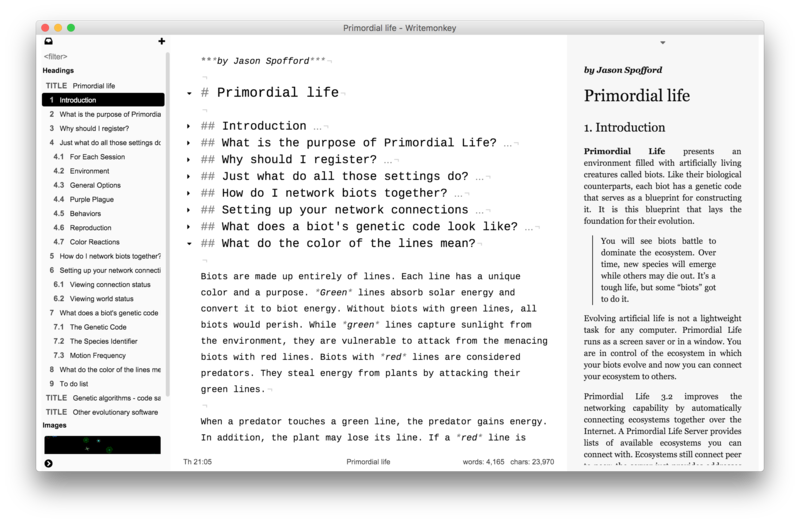 text editor for writers. Although it has some organizational and publishing capabilities it's primary function is to provide simple, engaging, hopefully even lovable writing environment. Icon files are included but you must (on Windows) create a shortcut to nw.exe and then assign the included `.ico` file to it. You can, alternatively, install new version into some other folder. That way both versions will work, but with the same database files. Be careful with that! Writemonkey 3 is a freemium software. It is free to download and use on as many machines as needed. There are, though, some goodies, namely plugins, that are only available to donors. Donors are those who supported the project (via PayPal) with any amount. Your donation goes straight to the developer that keeps this project alive. Thanks! To donate for Writemonkey 3 follow the ling below. PayPal accepts all major credit cards and payment is possible even without PayPal membership. Since WM3 is a complete rewrite, donor keys that were provided for WM2 are not valid for WM3.